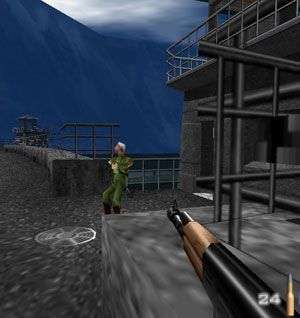 Have you gone back to play GoldenEye 007 for the N64 recently? On an actual N64 with the physical game cartridge and proper N64 controller? It sounds like a lovely experience doesn’t it? Dusting off the N64, blowing on the cartridge, take the old girl for a spin and spend an evening letting nostalgia wash over you like warm waves on a Caribbean beach. A few weeks ago I did exactly that, except I didn’t have a lovely experience; quite the opposite in fact. It was an uneasy feeling as it was something familiar to me, but alien at the same time; like visiting the playground my mum used to take me to only to find it has become a vomit-strewn drinking hole for delinquents. You would be wrong to assume that my unpleasant stroll down memory lane was because of the dated graphics – that wasn’t the problem. I make a point of playing The Secret of Monkey Island at least once a year, and compared to next-gen graphics, it looks like a Jackson Pollock painting. If it’s a game you love, the graphics are superficial. No, my problem ran deeper. I plugged the cartridge into the N64, switched it on, watched the opening animation with a knowing smile, hit ‘start’, selected the ‘Facility’ level, and assumed control of James Bond, and that’s when the problems began. I couldn’t look around properly; I could move around in the air vents but couldn’t aim with any fluidity. I managed to bumble my way towards the exit of the air vent which led into the bathroom, and tried to take aim at the guard in the next stall. It took longer than it should have to hover the cross-hairs over the guard’s head. I held my breath and took the shot. The Russian soldier, who was taking a dump standing up with his clothes on just moments before, was now very angry with me. I had missed. While he bolted out of the stall and started shooting at the air vent with the rest of his friends, I panicked and fell into the stall below. I spent so long trying to turn around to face the stall door that the soldiers had opened it for me and started to air me out with bullet holes. I ran out the stall, firing as I went, straight into the wall in front of me, strafed to my left, and tried to run sideways through the closed bathroom door. It was then that I became more bullet holes than person and fell forward in a heap, embracing sweet death – which the game was kind enough to show me three more times, and from different angles so I could see the full extent of my failure. To redeem myself, I wanted to make another attempt, so I went to the first level of the game – the ‘Dam’. I knew from memory that this level starts from behind an enemy soldier and there was also space available for some practice. I managed to find the control-style menu and discovered that the analogue stick was used for movement, the up-and-down C-buttons were used to look, while the left and right C-buttons were for strafing. This explained a lot. Armed with this new knowledge and reinvigorated confidence, I began practising by spinning around in a circle while looking up and down. After a few minutes of this, I felt ready. I shot the guard in front of me and set off across the map. I got as far as the first guard tower on the left when my confidence began to wane. In the space of five seconds, my brain disregarded the control-style information I fed it not two minutes earlier, decided it was playing Halo, told my right hand to press the left C-button to look at the guard patrolling in his tower, and I started to strafe to the left. After realising the mistake, my brain tried to correct it by pressing the right C-button, and I ended up strafing to the right instead. I was getting exasperated. I decided to take pity on the guard and made a bee-line towards the tunnel to my right. The guards at the opposite end of the tunnel had spotted my impressive spying techniques and congratulated me by shooting. I stopped immediately and tried to return fire. I held the R-button to bring up the aiming reticule, pressed up on the C-button, and ended up shooting at the ceiling. I admitted defeat not long after I resorted to looking down at the controller so I could see what buttons my hands were pressing. I was the worst spy ever. Had this been a real mission, it would have ended the moment I started bouncing around inside the air vent trying to find the exit. If I was on Her Majesty’s Secret Service before, my services would no longer be required. I was angry and frustrated with myself. This was a game I got for my tenth birthday, completed on the hardest difficulty, spent hours playing the multiplayer with friends, and mastered the kneeling-down-spinning-around-on-the-toilet-and-leaping-into-the-vents technique. But now I had been reduced to falling out of said vent. I was an embarrassment and I felt like I had betrayed my past self. I tried to find an explanation; how could I be so bad at a game I used to be able to play with my eyes closed during my childhood? Was it me? Was it the game? In a way it was both. I was at fault because I had changed with technology. I moved with the times and, slowly but surely, replaced the N64 controller’s single analogue control stick and C-button set-up with controllers that used dual analogue sticks. Over time, I grew accustomed to controlling first-person shooters on a console in a certain way: move with the left stick and look around with the right. Alien: Resurrection was the first FPS to default to using a dual-analogue set-up back in October 2000 (and was critically panned for it at the time) and since then Medal of Honor, Call of Duty, and Halo among many others followed using this setup. FPS games have been played like this on consoles for over fifteen years with no change, and any deviation now would feel wrong. As we know, developers have assigned ‘throw grenade’, ‘melee’, ‘crouch’, ‘sprint’ and so on, to every other button available on a controller over the years. Even then there’s been no issue adjusting to those changes, apart from the odd mistake where you end up throwing a grenade at an enemy’s head instead of assassinating them. Hell, even if it were causing you problems, you could go into the gameplay menu and assign your melee action to whichever button you want it to be, because where those actions are variable, the dual analogue sticks are constant. The game was at fault, because it stayed exactly where it was – stuck forever at that point in the technological timeline. I was trying to play a game within a genre whose look and movement controls had been optimised and had remained that way for fifteen years. My mind refused to accept the older control scheme for what it was: a precursor. Too much time had passed for me to retain any sort of muscle memory, and the only way I could have kept it is if I played it every year like I do with The Secret of Monkey Island. I’m sure I would be able to get used to it after a while, but I’m not ten years old anymore. I don’t have the luxury of sitting down to play a videogame for hours on end. I had to face the reality that, for me, GoldenEye 007 has been rendered unplayable. But I’m okay with that. In fact, even if I did have the time I’m not sure I would even want to go back. 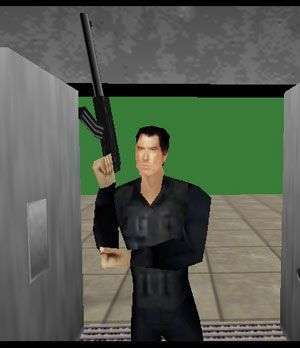 GoldenEye 007 was something special. It was a game based on a movie, and it wasn’t crap – a rarity indeed. I can remember thinking the scope on the sniper rifle was a balloon, and referring to the RCP90 as a ‘Toaster’. 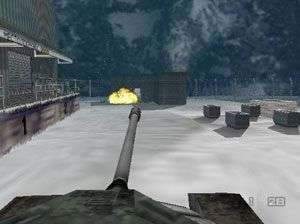 My friend and I used to take turns playing ‘Runway’, angling the tank in front of the building at the start of the level (where you would find the plane’s ignition key) in such a way that the waves of enemies couldn’t get at us – but they could throw grenades – and see how long we could survive. I don’t mind that I can’t replicate the experience anymore; it wouldn’t be the same even if I could. It was a snapshot of a happy time that gave birth to so many memories. It has its place in the past, and for GoldenEye 007, there’s no happier place than that. Well this was not only 100% accurate and extremely similar to my own experience I had a while back but it was also hilarious to read, there have been many a disappointing retro night for me, golden axe for one, being that it takes about 10 mins to complete lol, good job Eddy.